It’s weird reading biographies. There can be no great surprises, really; you do already know the ending after all. And in the case of Marie Antoinette, I know the outlines of her life so well that I was curious to see how Fraser shaped the events, rather than finding them out – especially of the last half of her life. I knew very little of her childhood and in fact did not realise that she was the youngest daughter of the Austrian Empress, which does add a particular shade to her upbringing. Overall I really enjoyed Fraser’s style, although the use of ellipses in a historical work is a bit weird. But she’s eminently readable; having the endnotes at the back of the book helps that, although it does also mean I didn’t look at any of them (none of them were discursive so I didn’t miss much). There were enough endnotes that I felt like I was reading a well-researched book, which I presume is accurate rather than being wishful thinking! Of the content, the one rather odd note for me was that Fraser accepts as highly likely the idea that Marie Antoinette did have an affair with Count Axel Fersen, Swedish soldier and general lover of women who did spend time at the court and indeed helped to arrange the escape that ended so disastrously at Varennes. I didn’t feel that Fraser offered enough evidence to make their liaison quite as certain as she suggested. Other than that, Fraser is quite sympathetic towards the Archduchess/Dauphine/Queen – and I have no problem with that. Fraser shows the many difficulties that Marie Antoinette faced throughout her life ( for instance, more than seven years of marriage before consummation brings problems on a whole range of levels when you’re meant to produce the heir), and does so with an eye for detail and, yes, with sympathy. That’s not to say that she shadows the problems that Marie Antoinette brought on herself, and those she did little or nothing to minimise; they too are investigated, sympathetically but rigorously, honestly, as a thorough biographer ought. Overall this is a really great biography, and reminds me that yes I really do enjoy reading history like this and maybe I should read some more. 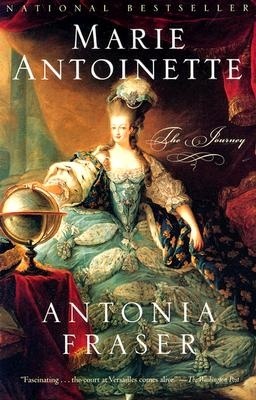 I believe that it would be quite accessible to those with little knowledge of the revolutionary period; it’s instructive of the way women were used politically in European aristocratic and royal circles for centuries, and reflects on the sorts of propaganda that is still used around powerful women today. You can get it from Fishpond.